Quality 1st Basement Systems of NYC is a proud member of the Brooklyn Chamber of Commerce. Because such a large part of our customers live in the Brooklyn, NY area, we wanted to ensure that we remain as involved with the neighborhood and other local businesses as possible. At the Staten Island Chamber of Commerce, thousands of business people are working together through the Staten Island Chamber of Commerce. Quality 1st Basement Systems is proud to stand beside other SI Chamber members, their employees, and families who represent every aspect of business life in Staten Island. We are committed to bringing superior service and products to Staten Island. 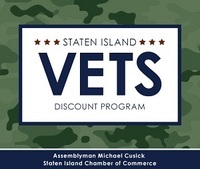 Quality 1st Basement Systems is involved in Assemblyman Michael Cusick's program called SI VETS Program which offers our veterans a discount on our listed services.